Clean Up Akron Month - Patterson Park - Keep Akron Beautiful Hasenstab Architects - Located in Northeast Ohio, Hasenstab Architects specializes in healthcare, simulation, laboratory, research, higher education, k-12, and office design. Hasenstab Architects once again participated in Keep Akron Beautiful Clean Up Akron Month! 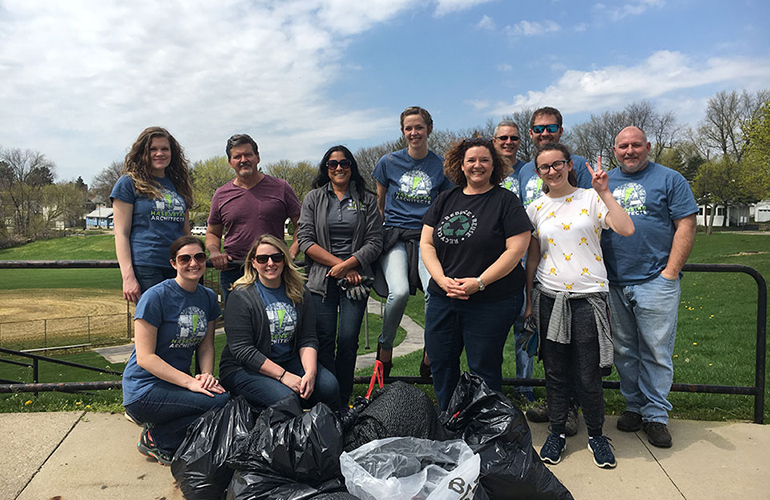 A group of Hasenstab volunteers returned to Patterson Park in Akron’s North Hill neighborhood for an afternoon of spring cleaning. Last year our team raked leaves, planted flowers and painted the park sign. This year’s focus was to clean up litter around the park. Patterson Park is made up of two baseball fields, a playground and basketball courts so there was a lot of area cover. We collected 12 bags of garbage and recycling.